Around 40% of domestic burglaries involve entry through either the front or the back door. To make them more secure you need good locks properly fitted to a sound door and frame, plus some additional security devices to suit individual doors. Your front door is theoretically the most vulnerable because it is your final exit point from the building, so you cannot bolt or otherwise secure it from inside the house. However other doors are at risk too, especially if they are out of sight or within an integral garage or conservatory where a burglar could work on them unnoticed. The front door may seem secure – it has a lock, after all. But what sort of lock is it? 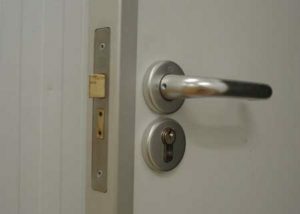 A surface mounted lock relies for its security on the strength of it fixings, and it is easy for a burglar to see whether it is the only lock fitted to the door. He also knows that two or three well-aimed kicks may be all that is needed to bust the lock away from the door for its frame. Glass panels in the door or in its surround make life even easier unless the lock can be deadlocked; if it cannot, all the burglar, has to do is break in and reach into the open the door. Even a mortise lock may not be enough if the door is thin or the mortise has been cut overly large, weakening the door stile. Backdoors are generally even more vulnerable than front doors. They are by nature less secure, often incorporating areas of glass and usually being secured by a low-performance lock or just by surface mounted bolts. They are also often concealed from view, allowing the burglar to force entry through them unseen. Outward opening French doors and sliding patio doors have additional weaknesses. The hinge pins when the former can be removed and the panes of the latter can be lifted out of the tracks unless anti-lift devices are incorporated in their design. Clear access to the back of the house also makes life easier for the burglar if side gates are not bolted or if boundary fences are easy to climb. 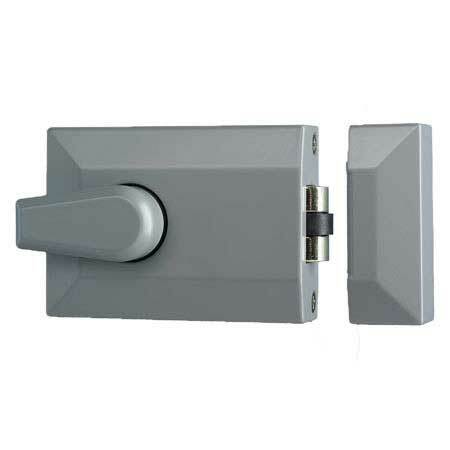 Door locks can be surface mounted or set into a slot (called a mortise) cut into the edge of the door. The former is quicker and easier to fit than the latter, but are generally less secure. These are known as cylinder rim locks, and consist of three main components – the lock body, which is screwed to the inner face of the door; the cylinder, which passes through the door to its outer face, and the steeple or keeper, which is screwed to the door frame. The security of this type of lock depends largely on the strength of the fixings used to fit the lock and keep it in place. When fitting such a lock you may want to replace the fixings supplied with longer screws for extra security. The simplest and cheapest type of rim lock is the night latch. This has a spring-loaded bolt operated by a key from outside the house and by an internal knob which you can lock with a movable button (for night time security). However, it is not secure from outside, since the bolt can be pushed back by inserting something flat and flexible between the door and its frame, and even if the door is locked it could be unlocked by a burglar after breaking an adjacent pane of glass. He can also use a night latched door as a quick escape route after gaining access to the house somewhere else. To be secure, rim lock must be capable of being deadlocked to prevent unauthorised forcing or operation without the key. The way in which better rim locks provide this deadlocking feature varies. Some deadlock automatically when the door is closed, and the knob can be locked with a turn of the key – usually from either side, sometimes from the outside only. Others do not deadlock automatically but can be deadlocked from either side using a key after the door has been closed. The best security is provided by rim locks made to the requirements of British Standard 3621 for thief-resistant locks and carrying the BS Kitemark. Such a lock will incorporate features designed to resist attack by drilling into the lock, sawing through the ball or forcing the mechanism. Many household insurance companies now insist that a lock made to this standard is fitted to your final exit door, and sometimes to other doors as well. Most cylinder rim locks can be fitted to a door irrespective of whether it is hinged on the left or the right. Some models come in different versions for left hand or right-hand doors. There are also slimline locks for glazed doors with narrow stiles. Mortise locks fit into a slot or mortise cut in the edge of the door. They come in two varieties: one contains just a key-operated bolt, the other known as a mortice sash lock – also contains a spring operated a latch. With both types, the bolt (and also the latch of a sash lock) engages in a keeper recessed into the door frame. The keeper may also be an open plate or may have a boxed metal recess for extra resistance to force. Provided that the lock and keeper are carefully fitted, a mortise lock is likely to be stronger than a surface mounted lock. The simple mortise lock is used chiefly for securing front doors in conjunction with a cylinder rim lock; the former lockable bolts provides a high degree of security at night or when the house is empty, while the rim lock provides a medium security at all times and can be conveniently unlocked using its knob when the house is occupied. The mortise sash lock is used mainly for back doors, where the latch allows easy operation of the door for access to and from the garden and the lockable bolt provides good security at night when the house is empty. The lock mechanism of mortise locks is usually a lever type, although some are now available with a profile cylinder mechanism similar to that used in cylinder rim locks. The security of a lever mortise lock depends on the number of levers it contains. Those with just two or three leavers can be forced or picked relatively easily and should be used only on internal doors. For external doors you need one with five, six or seven leavers; the strongest types, like the best cylinder rim locks, made to the requirements of BS3621 and carry the BS Kitemark. A BS3621 lock has to have at least 1000 differs, or key variations, so only one key in 1000 will open the lock – reasonable odds against a burglar having the same key as you. Five lever locks offer up to 1500 differs, while profile cylinder locks have several thousand unique key variations. In addition, the latter use the same type of key as a cylinder rim lock, and you can buy matching front-and-back door profile cylinder locks operated by the same key. 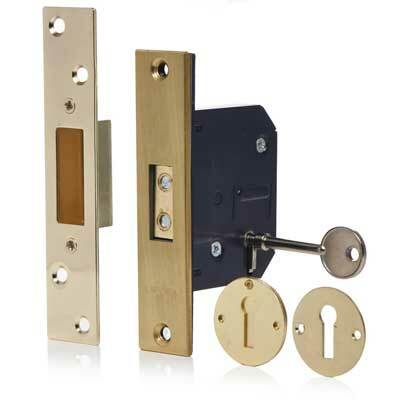 Mortise locks can be fitted to doors hinged at the left or right. Sash locks are usually sold in mirror image versions to sit the way the door opens, but those with a roller style latch can be fitted to doors hinged at the left or right. As with cylinder rim locks, slimline versions of both mortise locks and sash locks are available for glass doors with narrow stiles.